May 2016 - Guardian Safety Solutions International, Inc. Sadly, while lives were lost and additional people were injured in this Toronto fire, it was not caused by cooking. That said, it points out how important it is for senior housing to have laws and regulations to protect these elderly people from fires that are so destruction. Zoning laws, construction laws and training must be increased and secured throughout the US and Canada. 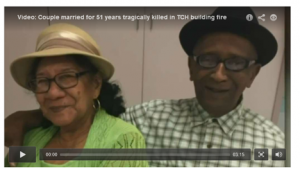 This couple married 51 years did not survive. According to TCH records, the building was last inspected for fire safety in 2013. Under the Fire Code, buildings that are classified as seniors homes must undergo annual fire inspections. However, the building on Nielson Road caters to people 59 years old and older, but is not classified as a seniors home and thus does not have to pass the same, strict provincial fire regulations as a seniors or retirement homes. Dallas – In the midst of Building Safety Month, launched by the International Code Council (ICC) and its 57,000 members worldwide, Guardian Safety Solutions International, Inc. (GSSI) is raising awareness in the industry by observing the mission of ICC’s public awareness campaign. GSSI is the leader in the development and manufacturing of superior fire suppression equipment for commercial occupancies where residential appliances are in use. The ICC, along with a diverse partnership of professionals from the building construction, design and safety community launched Building Safety Month 35 years ago. “Cooking fires are the number one cause of injury and death associated with fires,” said Paul Rouse, GSSI’s administrative officer. He added, “GuardianSSI champions the adoption of modern building codes, implementing a strong and efficient system of code enforcement and a professional workforce that works with code officials to increase fire prevention and safety.” Guardian products are designed to detect and extinguish fires and prevent re-ignition in senior housing facilities, college campuses, churches, fire stations, hospitals and other commercial occupancies. “The Guardian fire suppression systems are increasingly accepted nationwide as code officials are educated to the hazard protection advantages the GSSI systems provide,” Rouse said. “We offer ongoing training to code officials when they sign up on our website,” Rouse added. GuardianSSI recently launched the Guardian Model G600B to include electronic operation with electric and gas ranges (watch the video demo). It works with any standard over-the-stove microwave/range hood. Each system is UL/ULC listed with a gas or electric fuel shutoff. The G600B has an updated, integrated self-diagnostic CPU board with a monitored pressure gauge. It features a pull-pin holder for arming the system, an alarm connection for a trouble and activation signal, quick and easy plug connectors and an RF transmitter and receiver for wireless shutoff connections. Benefits of Guardian systems include automatic operation, continuous 24-hour protection, concealed installation, easy clean-up and proven reliability. For end users, Guardian Fire Suppression Systems offer substantial savings over a traditional commercial system. Guardian Fire Suppression Systems have been used and supported in more than 400,000 installations worldwide and have been UL listed since 1985. For more information, contact GSSI at 800-786-2178 or visit www.guardianssi.com. “Like” Guardian on Facebook at GuardianSSI and follow on Twitter @GuardianSSI. Dallas – May 09, 2016 – Guardian Safety Solutions International, Inc. (GSSI), the leader in the development and manufacturing of superior fire suppression equipment for commercial occupancies where residential appliances are in use, is exhibiting at the National Association of Fire Equipment Distributors (NAFED). The Sectional Conference & Expo is May 12 – 13, at the Westin Hotel Indianapolis. NAFED’s guiding mission is gathering and disseminating information and ideas that will improve the world’s fire protection and increase the fire protection industry’s competence. “NAFED is a key player in the fire protection industry showcasing the latest technological advances. That’s why we are showcasing our new Guardian G600, the only current listed system designed to work with an over the stove microwave,” said Paul Rouse, GSSI’s administrative officer. “Our Guardian products are designed to detect and extinguish fires and prevent re-ignition in senior housing facilities, college campuses, churches, fire stations, hospitals and other commercial occupancies,” Rouse said. Benefits of Guardian systems include automatic operation, continuous 24-hour protection, concealed installation, easy clean-up and proven reliability. For end users, Guardian Fire Suppression Systems offer substantial savings over a traditional commercial system.